Coretta Scott King was valedictorian of her high school. She met her future husband while in college – she was studying voice at Boston’s New England Conservatory of Music while he was a graduate theology student at BU. They married in 1953 and had four kids. As a teenager, Coretta Scott King experienced horrifying racial violence – someone burned down her family’s home and her father’s business. Years later, and just a few days after the Montgomery bus boycott began (that boycott is widely considered the earliest mass protest for civil rights in the United States – Dr. King was one of the leaders), the Kings’ house was bombed while she was inside with her ten-week-old baby. They weren’t hurt. The success of the bus boycott (it led to desegregation of city busses) helped make Dr. King a face of the civil rights movement. He began leading marches in several cities, with Coretta by his side. Four days after his assassination, she led the march he was supposed to. 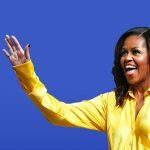 In subsequent years, she not only took up his fight for racial justice, she broadened it – also speaking out in support of the poor and homeless, religious freedom, women and children’s rights, and gay and lesbian rights. Among her many accomplishments – she founded the Martin Luther King Junior Center for Nonviolent Social Change. More than one million people visit The King Center every year. She also created the Coretta Scott King Book Awards, honoring African American writers and illustrators who show an appreciation of African American culture and universal human values. She also played an integral role in establishing her husband’s birthday as the national holiday we celebrated two days ago. 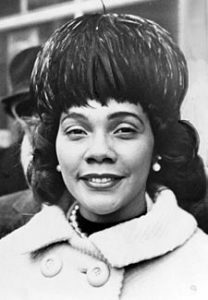 Coretta Scott King died in 2006. She’s buried next to her husband at The King Center in Atlanta, Georgia.